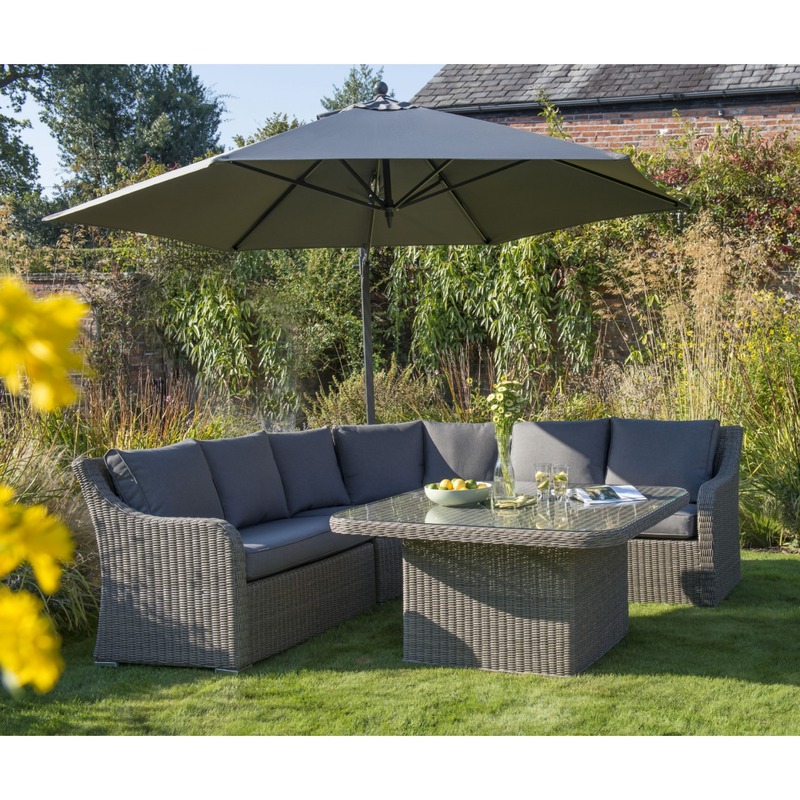 Buying garden furniture – where do you start? There’s lots to choose from, but much of it looks very similar even though the prices can vary tremendously. 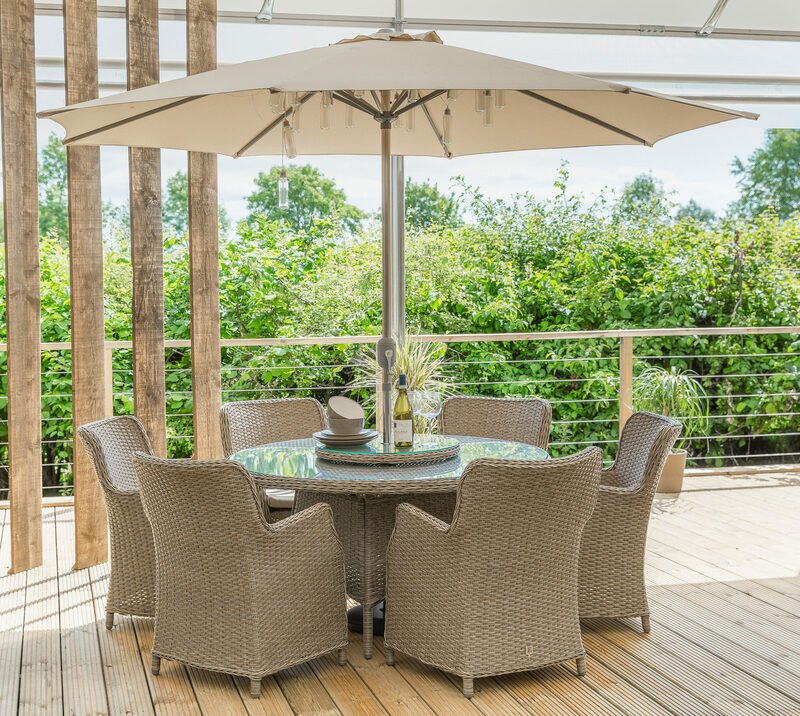 Based upon many years of conversations with people who are looking for their ideal garden furniture, these are our main takeaways. Size matters | Although the day-to-day role of outdoor seating and dining spaces might be to cater for your immediate family, don’t forget the need to allow for those who might turn up as soon as they smell the food on the barbie – unless you don’t mind wrestling for seats. 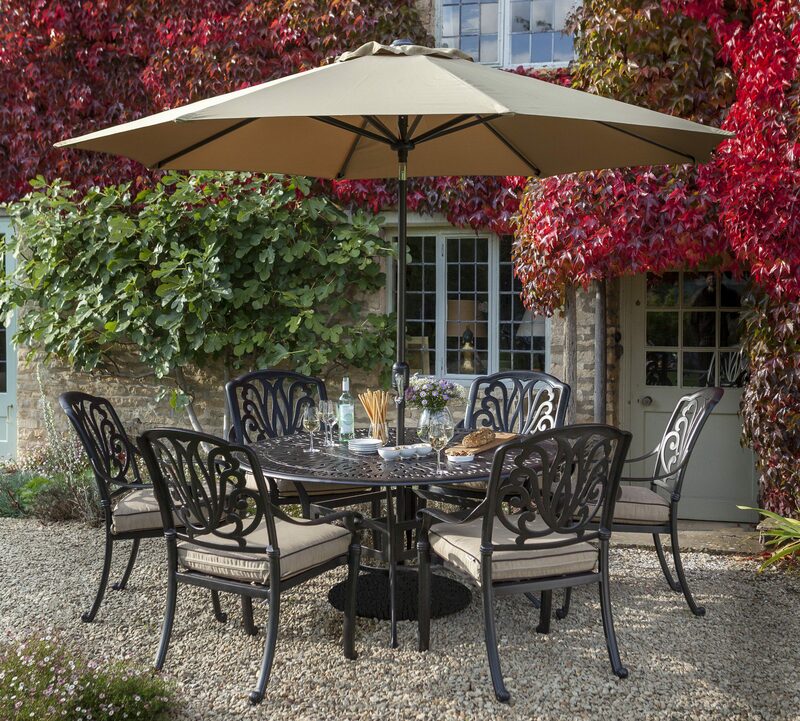 Better to get a garden set that can take some overspill, than later realise you need more chairs or another table in order to cope. Sometimes additional chairs to match an existing set are hard to come by, or a particular model might be discontinued – so it’s back to the miss-matched set-up that made you want to buy a new set in the first place! Do the numbers – then add a few more. Your family can always spread out for everyday use, and you’re also equipped to share your leisure space with visitors too. usually UV-resistant and able to cope with the heat that can build up behind glass. Watch out for natural wood products though as they may be OK to be left out in the elements all year, but not be as suited to sitting in a sealed conservatory on a hot summer’s day. 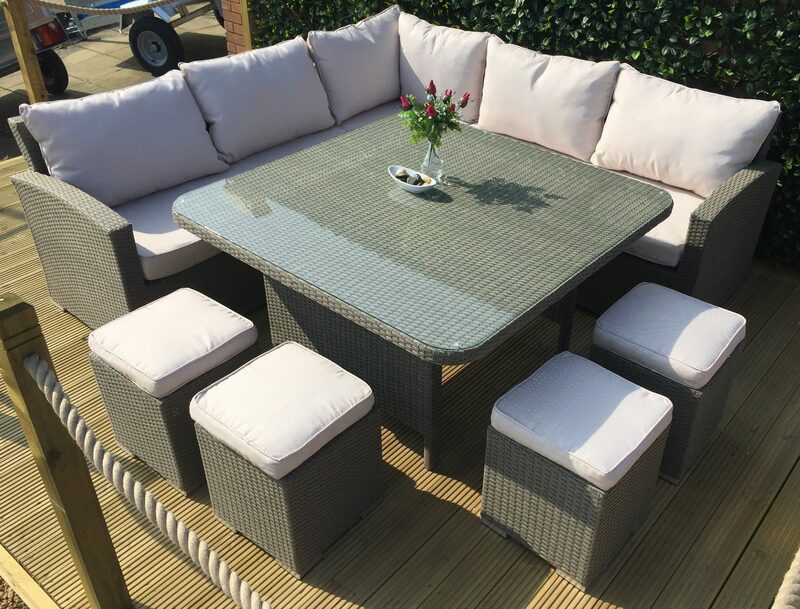 Other than this, materials used for garden furniture by the main commercial manufacturers should be fit for purpose – waterproof, durable, equally resistant to frost and bright sunlight. Some manufacturers go even further by including resistance to suncream, alcohol and detergents too – so that’s the summer parties and post-party clean-ups covered then. Special care usually has to be taken for furniture cushions though – as covered below. Plus, see more on materials below too. 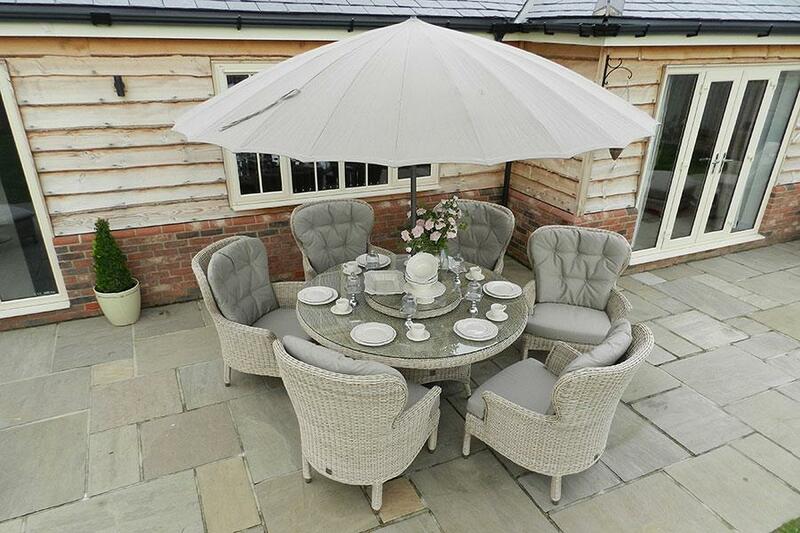 but there are some interesting alternatives when it comes to garden furniture. For instance, modular corner sofas can be used in different configurations, either to suit changing needs of if you just feel like a change, and they can also come with stools and bench-style extra seating for even more seating flexibility. 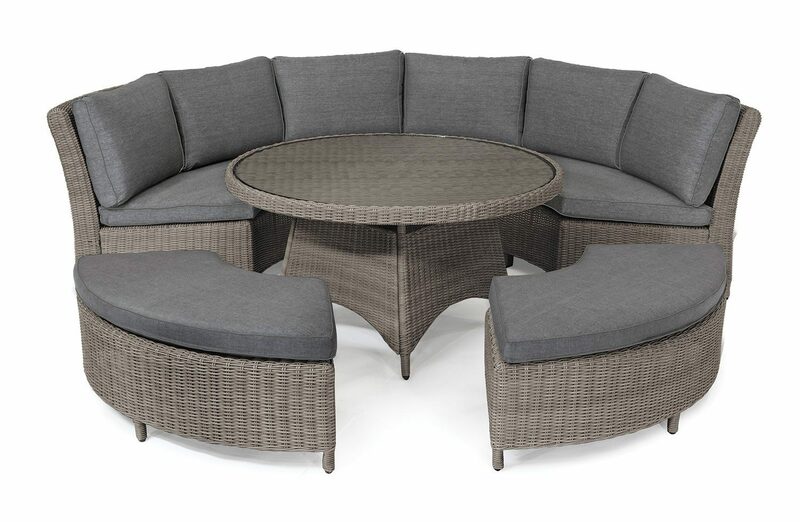 Casual-style outdoor dining is also popular, with sofa-style seating matched with lower-level tables – sometimes adjustable-level tables that give you the best of both situations. Then there’s wrought-iron bistro-style sets, traditional ‘colonial-style’ rattan-look sets and the more minimalistic ‘techie’ look – something for every taste, every age group and every position, whether it’s an olde-English rose garden or the balcony of a chic urban apartment – the choice is yours. comfortable to sit in, but can be difficult to manoeuvre if sitting up to a table (both due to their solid weight and the spar that often joins the front legs, preventing you getting to your feet unless adopting ‘Limbo’ mode! 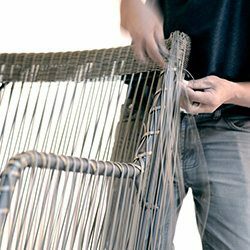 By comparison, more modern weave-style garden furniture is usually based upon lighter-weight steel or aluminium frames that are much easier to move around. As you may not realise this kind of thing until after you’d taken the plunge and bought the furniture, we can’t emphasise enough the benefit of being able to compare different types and styles as ‘try-before-you-buy’ really is sound advice, especially with an outlay on this scale. Last point on the weight issue...just as lighter weight is beneficial for some items, heavier weight and solidity can obviously be advantageous for items such as traditional garden benches and gazebos etc. Sometimes there’s nothing quite like the substantial feel of solid wood or well-engineered metal when compared to flimsier – though perhaps cheaper – alternatives. furniture materials will cope with bad weather, but what about the bird-dirt, dead leaves, general dust and dirt that blows around and the green algae that tends to have covered everything by the time it comes to spring? This is where furniture covers come in. Most of the manufacturers make them for their own ranges and there are also companies that produce standard-sized covers to fit most generic types of dining set, chairs and sofas, plus barbecues, patio heaters, benches – you name it, they’ll usually have something that fits. Covers basically save you the springtime job of having to brush, hose or pressure-wash your garden furniture to restore them to a smart and usable state, so they’re well worth the extra investment. But, take note, seat cushions shouldn’t be kept in place beneath protective covers, or they’ll probably absorb condensation and end up with staining mildew or mould on them. See more about cushion design and materials below. synthetic material, to give you a chance of wiping them clean. 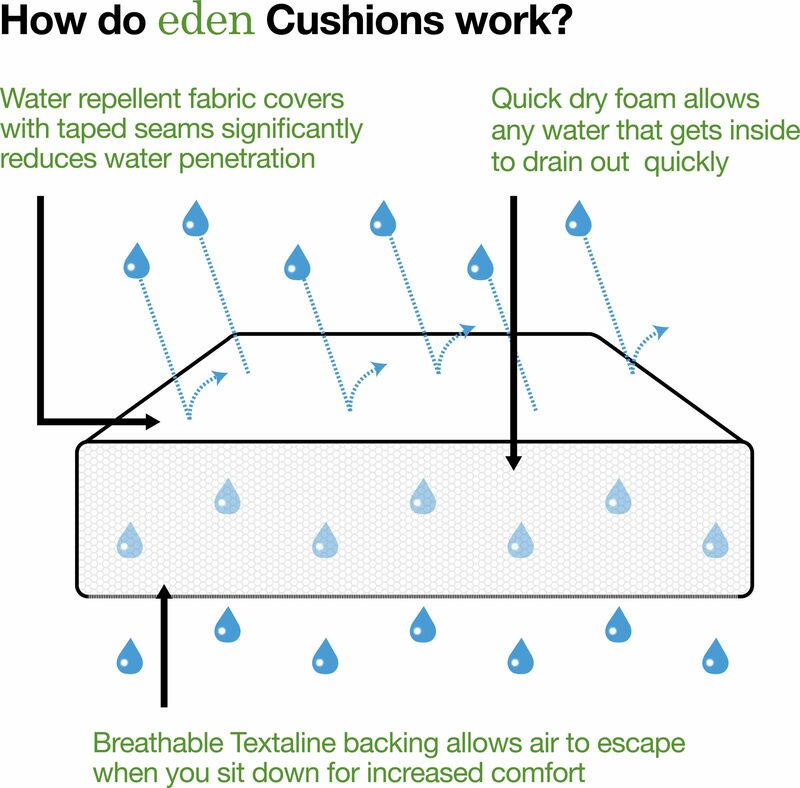 But some manufacturers have done more to allow easy usage and tackle the weatherproofing issue, by either covering their cushions with waterproof material (which tends to make them feel slightly ‘rubberised’ to the touch – not everyone’s cup of tea), or by taking the opposite approach – letting rainwater pass straight through the cushion covers and using special foam inners that quickly shed water, letting them dry-out quickly for you to use again. These newer – ‘all-season’ – cushions only tend to be available at the pricier end of the market, but give you the flexibility to leave them in place on the furniture without the need to store them away each evening – or whenever a raincloud comes over. Nevertheless, we’d still recommend that even these are stored away when not in use over the winter months – saves all the cleaning. 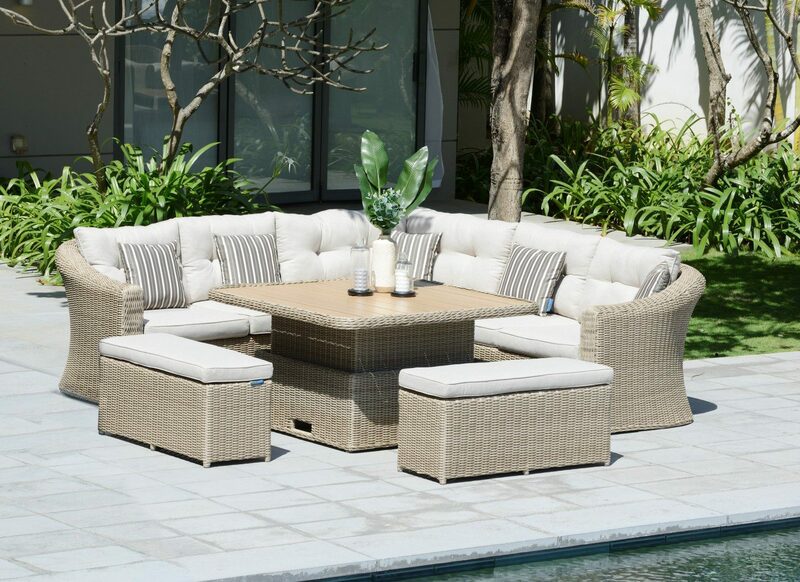 Taking a different approach altogether, one relative newcomer to the garden furniture marketplace – Bramblecrest – has set out to bridge one of the main indoor / outdoor furniture differences by fully integrating most cushioning into the furniture – meaning that you can’t remove most of the cushions at all. The aesthetic end result is a really pleasing, different look and, for practicality, cushion material is easy to clean, water, stain and mould-resistant – though protective covers would still make sense for the winter to preserve your furniture’s condition. Last word on cushions...if you have potentially messy little ones around (or messy big ones for that matter) perhaps think twice before going for white, cream or pale grey colour tones as ‘table-manners’ can tend to be a bit more relaxed when sitting in the garden and even wipe-clean material might struggle with tomato ketchup, barbecue sauce etc. waterproof, UV-light resistant, not affected by detergents and other household chemicals, and often self-coloured so that knocks and scrapes won’t be noticed. Finally, choice of materials can determine how much maintenance your garden furniture might need – though, usually by common agreement, the best maintenance situation is to have none to do! Check with the retailer before you make your decision: you’re buying it to enjoy, relax and generally enhance your leisure space and time – the last thing you want is another item on your ‘household jobs’ list! 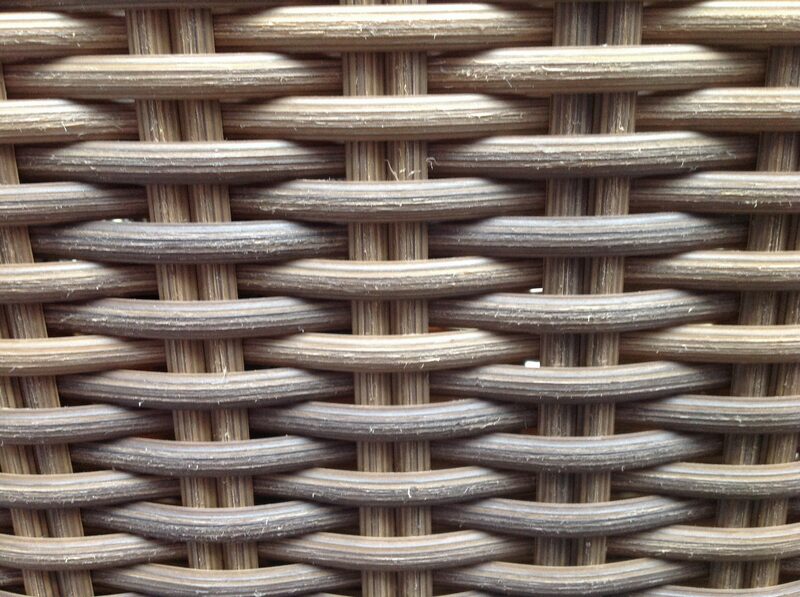 use durable low-maintenance synthetic material woven in a traditional basket-style, with a rope trim around the edges as a design feature. Cushions are covered in premium Olefin yarns, making them rot and fade-proof – and can easily be brushed clean. Sets generally carry a 2-year warranty on the cushions, plus a full 10-year warranty on the weave. 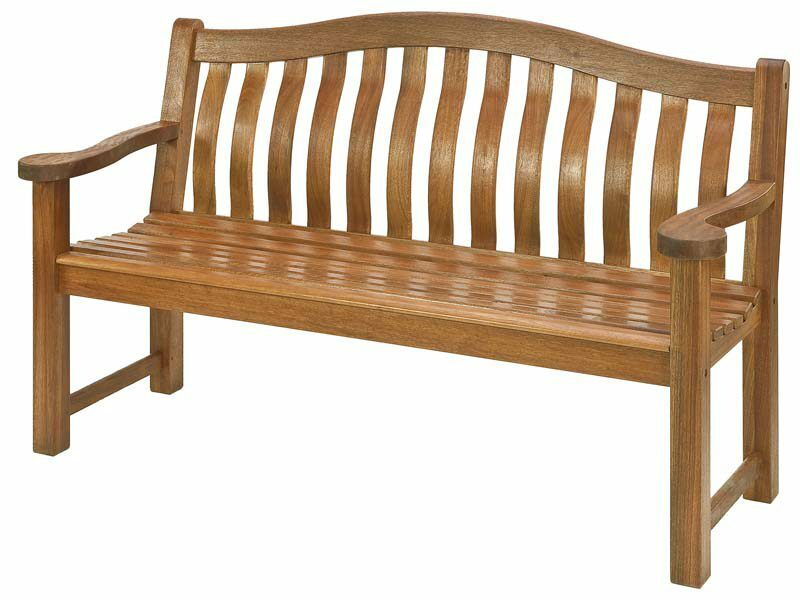 Particularly renowned for the craftsmanship that goes into their fine range of traditional hardwood benches. 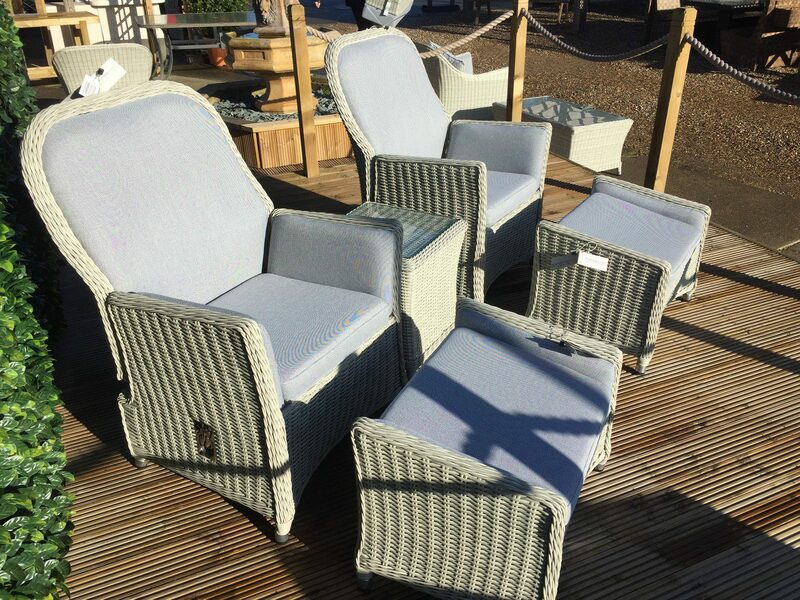 as mentioned, they take a different approach by integrating most cushioning into the frames of their furniture, giving a highly-finished feel – though a little more care needed when it comes to covering up against the elements and the dreaded bird-poo! Very well-made, very stylish and some cute features – like adjustable-height tables that are as suited for coffee or drinks as well as for formal dining. 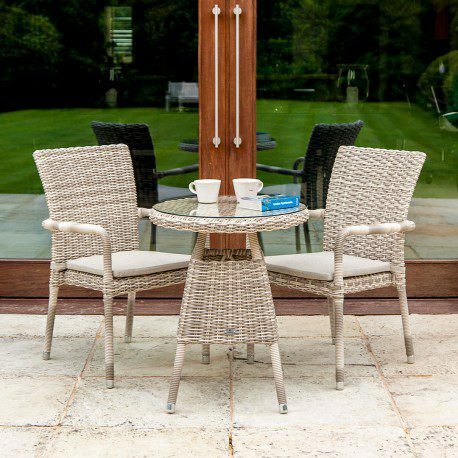 Hartman –particularly renowned for their stylish range of Amalfi cast-aluminium garden furniture that gives a very different look to most other offerings. Includes the innovative Jamie Oliver range which integrates a grill or ice-bucket into table centres for that really chic touch when entertaining. Top of the pile for looks. Kettler – great build and materials quality and a particular emphasis on contemporary design which makes them extremely popular at the top end of the market. Some lovely, clean designs – both angular and curvy – and also have a good range of furniture covers to keep everything clean when not in use. Leisuregrow – a good range of well-made and well-priced garden and conservatory furniture – including a beautifully-designed Hanging ‘Egg Chair’ and Daybed for those who want to relax right into ‘sleep’ mode. Just made for summer days. 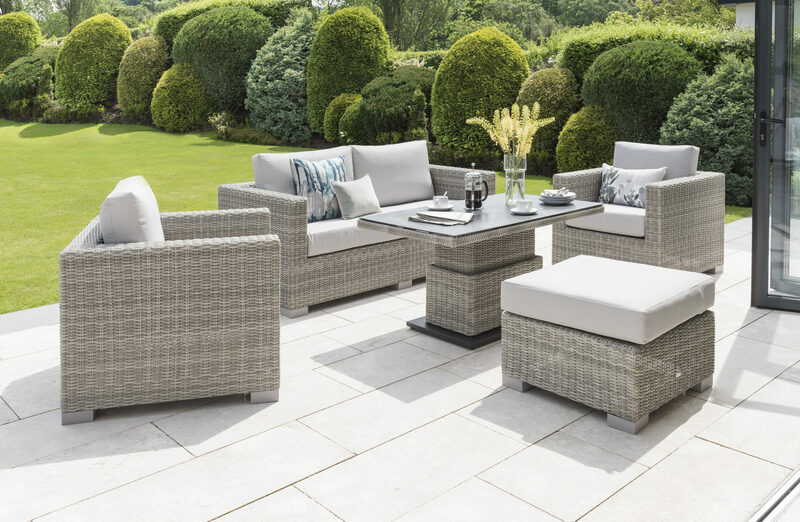 Life Outdoor Living – offer stylish, contemporary garden furniture that perhaps mimics more than most the feel of the furniture you may have in your lounge. Also have height-adjustable coffee / dining tables for practicality of usage. Simple, bold and solid. Lifestyle – offer a variety of nicely-designed offerings at really competitive prices, from formal and casual dining sets to incredibly comfortable garden armchairs with footstools. Well worth considering. 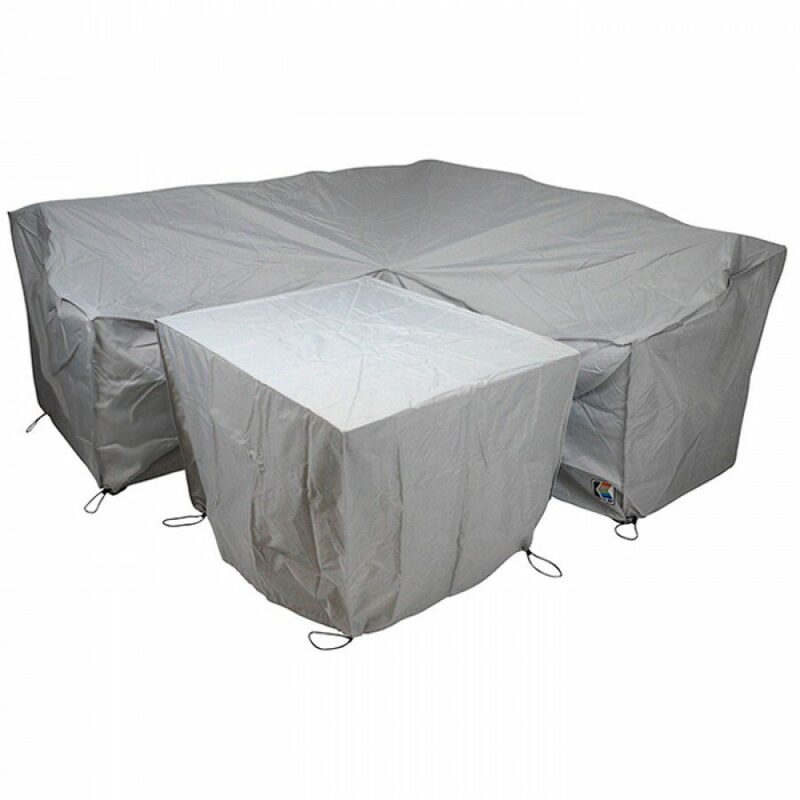 Norcamp - have a wide variety of designs, bringing you all the style and build-quality of the better-known brands, though often at lower prices. Their range covers everything from 2-seater bistro-style sets to a home-bar for entertaining late into the evening. But how do you decide which one’s for you? Well, with all of the above in mind, have a good look around locally to get a feel for which manufacturers’ offerings you particularly like – or dislike – and which best fits the mental picture you have of optimising your household leisure space. A visit to your local manufacturers’ stockists or garden centres will soon get you attuned to what’s out there – and carrying out ‘valuable research’ whilst at friends’ barbecue parties can be good fun (as long as you make up your mind while the good weather’s still here!). 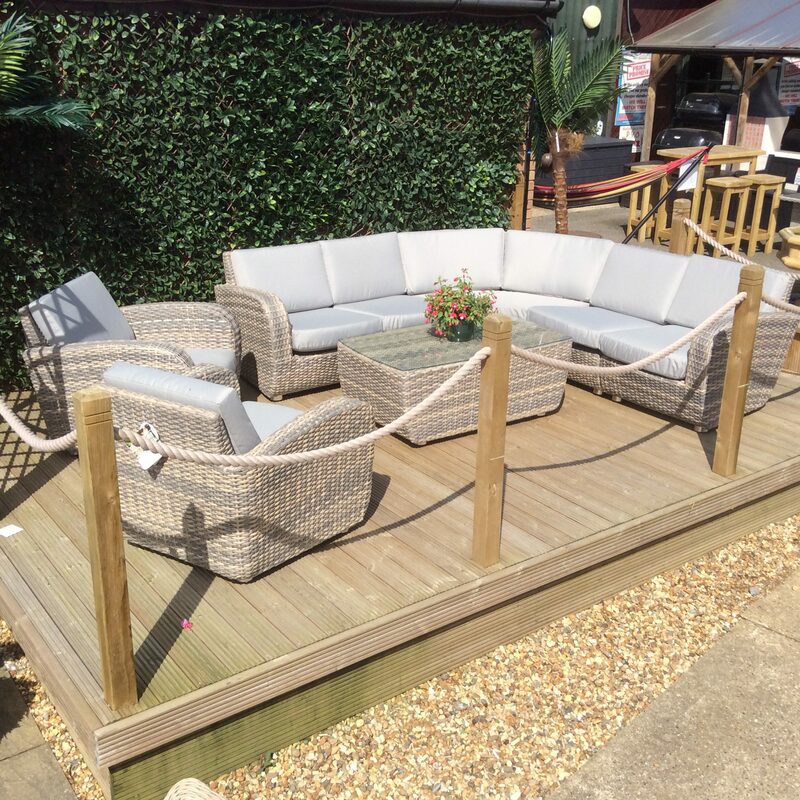 Realistically, after your outdoor furniture ‘test-drives’ to gain experience, you’ll want to compare prices online to make sure you’re not paying over the odds. This will be a lot easier once you have makes and models in mind – but just watch out for delivery charges as complete garden sets can obviously be bulky and heavy, so don’t get caught-out. As with most things you might buy, ‘you get what you pay for’. Yes, there are always cheaper garden furniture options – sometimes temptingly cheap – and that’s probably OK if you’re on a strict budget and just looking for something to last you a season or two. But, if you see your furniture lasting a decent length of time, as an integral part of you enjoying your leisure space – whether it’s your garden, patio, decking, terrace or veranda – then it’s perhaps worth investing in something that makes you feel good every time you use it. 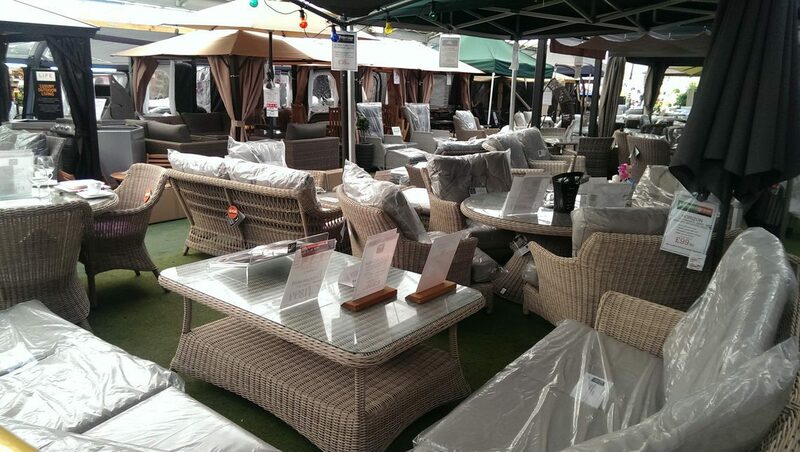 Ideally, as everyone likes a bargain, why not have it both ways and wait until you see garden furniture from the better brands when it’s at offer prices? This can make a big difference to the price that you pay – and may just help you relax even more when you’re sipping that cold drink in the garden. Norwich Camping & Leisure Village, in Blofield, east of Norwich, Norfolk, has one of the UK’s largest outdoor displays of tents and awnings, plus indoor showroom displays of camping & caravanning equipment, outdoor clothing, garden furniture & buildings, barbecues and a fully-stocked garden centre. Barbecue brands in stock: Weber; Napoleon; Outback; Campingaz; Char Broil; Broil King and Cadac. The Leisure Village also has a farm shop, coffee shop, in-season pick-your-own fruit fields and a professional-standard car, camper & caravan hand-wash station. With over 40 years of experience and practical, friendly advice – plus FREE NEXT-WORKING-DAY DELIVERY on orders over £100 (Terms & Conditions apply) and our Best Price / Price Match Policy and low-rate finance terms why not find us online or come along and see us! www.norwichcamping.co.uk Tel: 01603 717600 [email protected] Follow us on Twitter! Previous Article: Outdoor Heaters: Get ready for the cooler evenings!